Our work in partnership with University of San Carlos of Guatemala continues as part of our agreement signed in 2016 with the support of Dean Durgan. One of the aims of this partnership is to build the capacity of faculty and students working with families and youth in professional practice before graduation. This practice, called Professional Supervised Exercise (EPS in Spanish), is a mandatory internship for students. EPS is engagement in a community to assess needs, develop projects and partnerships with local organizations to promote wellbeing. The faculty and students do this with support from San Carlos University Extension which has the same mission as our land grant University here in Minnesota. The students spend one semester in communities in need, and with families and youth that face many challenges and risks from poverty and marginalization. We shared with the faculty the way we work with families and youth. 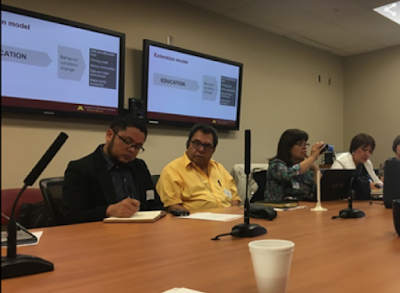 We also talked about our framework and programmatic interventions to address the needs of underserved populations in Minnesota. The EPS supervisors and faculty then decided to start a pilot in three selected communities. 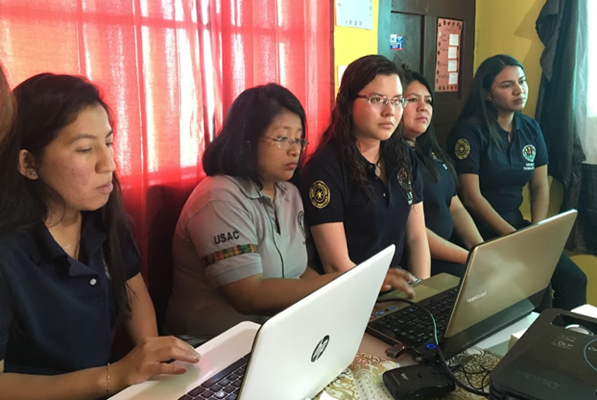 In January 2018, in partnership with University of San Carlos faculty and our evaluation team, we developed tools to collect data focused on families and youth. The EPS students collected data to assess family and youth needs in their communities revealing opportunities for programs and to promote changes that would contribute to the wellbeing and healthy development of youth. We spent a week with our faculty partners during May on the St. Paul campus analyzing the data. Together we developed a logical framework and identified programmatic opportunities. In early August, a group of leaders and educators from both Family Development and Youth Development organized a virtual training for the new students starting their EPS, covering topics such as project design, family resilience and youth development. Two weeks later the students and their supervisors attended a virtual training to use an evidence-based program for families and youth. This family approach program is intended to reduce youth tobacco and other substance use, while strengthening family relations. This family program was developed in Spanish and piloted in partnership with local Latino organizations in Minnesota. The training was well received and University of San Carlos students were excited to use this program as a tool to work with families, develop trust in the community, and engage in a new process. The students got access to our Moodle site and used the facilitators’ manual and handouts to facilitate the program. Students went to their communities in late August, and during an October site visit in Guatemala, we were able to see what the students have done in a short period of time. Center for Family Development team at University of San Carlos with faculty and students in Guatemala City, Guatemala. What we observed on the site visits was not a surprise. The students have the challenge to engage busy families facing lack of time, childcare and other obstacles similar to those facilitating the program to their specific needs and circumstances under the supervision of engaged faculty that see the value in working with youth and families. We also saw many opportunities to expand the pilot in addition to these three sites that are on the margin of urban areas. As part of our last visit we were able to go to the countryside and visit students implementing a needs assessment focused on families and youth in two more areas. The students were using the same tools used by previous students, and started partnerships with public schools introducing sports for teens to promote positive development. Youth and social worker from the local clinic participating in the program on the margin of an urban area. We were impressed by the energy and commitment of the students when they told us about their EPS work in the countryside. They were engaged with community organizations and identified opportunities to work with youth and their families the following semester. Some of the students were also trained using a train the trainer model about physical activity in the classroom. They are using a manual developed by the National Sports Federation and plan to expand the pilot to these areas using this manual as a tool to work with youth and their families in partnership with public schools. This year we were able to use a virtual training to cover specific topics and guidelines to facilitate a program. Although the technology helps us to break distance, it prevents us from the personal contact we had on this site visit. With this on-site experience and feedback, we are preparing an in-person training in February 2019 to train a new group of students and their supervisors, and introduce new programs, tools and strategies to work with families and youth, expanding the pilot. Group of students sharing their findings at a work meeting in Quetzaltenango, Guatemala. At one site, the student was able to present the program to fourteen families with youth. She facilitated four sessions out of eight, combining two topics in each session to accommodate for the time constraints parents had. She also partnered with a local community organization that runs a private school. During a meeting in Guatemala, we talked to a mother and fourteen-year-old daughter who shared how beneficial the program was for their family. Student facilitating the program in Guatemala City. In the second site, the student was working all this semester in building a relationship with one private school in the community. This was a challenging situation for the student because the principal was not open to the implementation of a program that is not centered in Christian values. The student then started building other partnerships in the community, one with the public school. We visited a K-8 public school where the program will be implemented next semester. The principal is ready to become a partner and sees the need for the program. In the third site, the student is implementing the program in partnership with the local clinic. One of the main risks parents see in this community are organized “gangs” and the recruitment of youth. During our visit, we observed a session and spoke to families that see the benefits of this program because they are learning parenting skills and are talking about adolescent development to support their children in this transition.